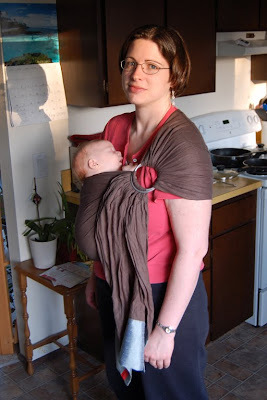 I loved my sling! This is a fun picture too. OH! How wonderful!!! So lovely. Very nice! And looks a lot safer than some other ones I have seen. Yeah for getting things done! A beautiful picture! I love how the light is shining in from the window, creating your shadow on the wall. I've wanted a Sakura Bloom sling ever since Steph held her triathlon. Perhaps for baby #3? Oh your little boy feels so secure and all loved up in that sling! I would want to "babywear" too when and if I'll have another baby!